Features a 100% velcro brand hook interior to firmly grip all 3-strand and double braid line, no add.. These premium grade PVC piling bumpers can be mounted on a curved or flat surface. Internal strength.. Heavy-duty, economy "C" Shape co-extruded profile is made of marine grade PVC with UV inhibitors to ..
Marine grade flexible white PVC, will not chip or crack under normal usage and is unaffected by gas,.. Developed specifically for AIR CUSHION spot protection. Like having a fender mounted where its neede.. This extruded U.V. stabilized polyethylene foam bumper with UV inhibitors is contoured at the back s.. Heavy duty air-filled bumper is constructed from marine grade PVC and features a built-in air valve ..
Dock side dock bumper corner Size: 12" x 12"Mount: Corner.. Heavy-duty. Without a lip can mount vertically or horizontally anywhere on the dock face. Great for .. Bumpers are manufactured from roto-molded marine grade PVC with UV inhibitors and fungicides. Will n.. Heavy Duty. The economy Dock Guard co-extruded profile can be used in light to medium duty applicati.. Smooth rolling wheels offer substantial dock cushioning and feature molded-in valves to adjust the l..
Modular Bumper System. Premium foam profiles.This revolutionary new design incorporates a soft expan..
Dock bumper 34 foam Size: 34"Color: NavyDescription: Dock Bumper..
Dock bumper 38 foam Size: 38"Color: NavyDescription: Dock Bumper..
Dock corner eva foam Size: 24"Color: NavyDescription: Dock Corner.. Designed with both smooth and ribbed surfaces. Made from flexible PVC with UV inhibitors and fungici.. Heavy-duty. Ideal for larger applications. Double internal channels with cross girder adds additiona.. This exceptionally strong Profile is further reinforced by two internal supports. like all Dock Edge..
Made from high impact polyethylene (HDPE) with UV stabilizers to prevent cracking or deteriorating a.. 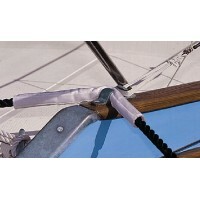 Ideal for both motor and sailing boats. The forces the line is exposed to are taken up by the elonga.. Stainless steel will prevent unsightly staining caused by rusting of regular steel fasteners. Oversi.. Prevents piling tops from splintering and weathering. Made from Marine Grade PVC. Size: 10"Color: Bl.. Prevents piling tops from splintering and weathering. Made from Marine Grade PVC. Size: 10"Color: Wh.. Prevents piling tops from splintering and weathering. Made from Marine Grade PVC. Size: 11"Color: Bl.. Prevents piling tops from splintering and weathering. Made from Marine Grade PVC. Size: 11"Color: Wh.. Prevents piling tops from splintering and weathering. Made from Marine Grade PVC. Size: 12"Color: Bl.. Prevents piling tops from splintering and weathering. Made from Marine Grade PVC. Size: 12"Color: Wh.. Prevents piling tops from splintering and weathering. Made from Marine Grade PVC. Size: 7"Color: Bla.. Prevents piling tops from splintering and weathering. Made from Marine Grade PVC. Size: 7"Color: Whi.. Prevents piling tops from splintering and weathering. Made from Marine Grade PVC. Size: 8"Color: Bla.. Prevents piling tops from splintering and weathering. Made from Marine Grade PVC. Size: 8"Color: Whi.. Prevents piling tops from splintering and weathering. Made from Marine Grade PVC. Size: 9"Color: Bla.. Prevents piling tops from splintering and weathering. Made from Marine Grade PVC. Size: 9"Color: Whi.. These heavy duty bumpers are manufactured from PVC with UV Inhibitors and Fungicides, have excellent.. Heavy-duty. Provides a larger contact area for added protection, combined with resiliency and durabi.. Heavy-duty. Perfect for small outboards or PWC's. Length: 16' roll..
Dock side dock bumper 7 x 16 Size: 7" x 16"Mount: Straight..
Dock side dock bumper 8.5 x 2 Size: 8-1/2"x 24"Mount: Straight.. This large, durable bumper adds an attractive and functionally rugged cushion to the leg pipes of yo..
Marine grade vinyl material. Molded-in ribs on the interior ensures that it is durable, will not col..